A resident called Vienna police after she found unwanted bags of dog poop and trash in her yard last week. 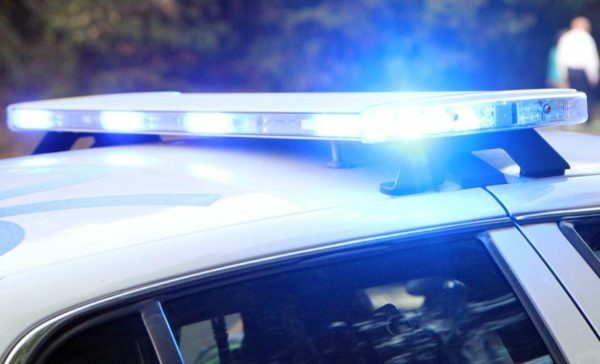 The incidents took place in the 100 block of Dogwood Street, SW between 7 a.m. on Monday, April 8, and 6:07 p.m. on Friday, April 12, according to police. “A resident reported that there have been a couple of occasions when someone as left bags of dog excrement and trash in her yard,” according to today’s Vienna crime report. 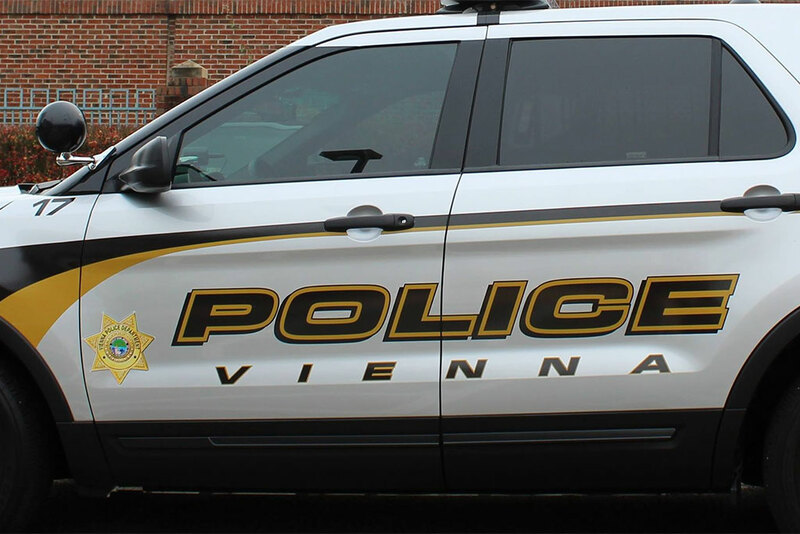 Elsewhere in Vienna, this week’s crime report includes a case of a Windover Avenue, NW resident who “reported she has received packages from Amazon that she never ordered” between last Wednesday, April 10, and Wednesday, April 17. 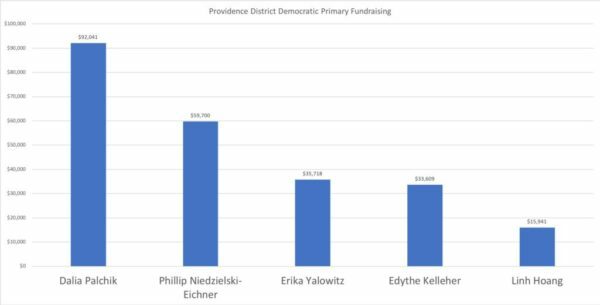 “The person placing the order is using some of the resident’s personal information,” the report says. 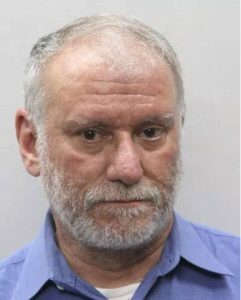 Fairfax County police have arrested Jeffrey Cummins, owner of the Huntington Learning Centers franchises in Tysons and Springfield, on charges of sexually abusing of two former students. Cummins is a music teacher who gives lessons in his Annandale home and, in addition to the Huntington Learning Centers, is the founder and artistic director of Virginia Music Adventures — a music group for school-age children — according to a police report. Detectives began their investigation in May 2018 when a juvenile disclosed that he had been inappropriately touched by Cummins over a period of several years. In January of this year, another victim came forward and disclosed he had also been abused for several years by Cummins. The investigation showed that the sexual abuse occurred both during music lessons and at other times when the juveniles were at his home. Police say anyone who is concerned their child may have had inappropriate contact with Cummins should contact the Major Crimes Bureau at 703-246-7800. 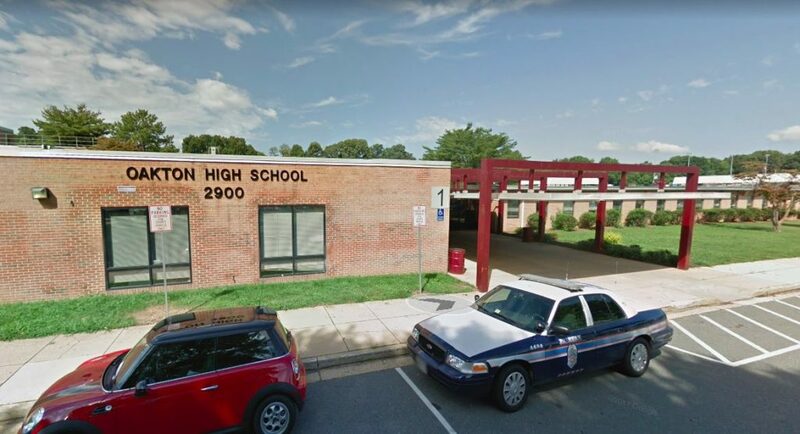 Police say a Vienna resident broke into Oakton High School early this morning (Tuesday) and was seen riding a scooter around the hallways while trying to get into classrooms. Around 1:41 a.m., security at the school reported that they saw someone riding a scooter inside of the school trying to open classroom doors, according to a police report. The report says police found the man in the parking lot and placed him under arrest for unlawful entry and trespassing. Fairfax County police are looking for an armed man who tried to rob a hotel employee but ended up leaving empty-handed. The incident took place around 3:30 p.m. on Friday, April 12. 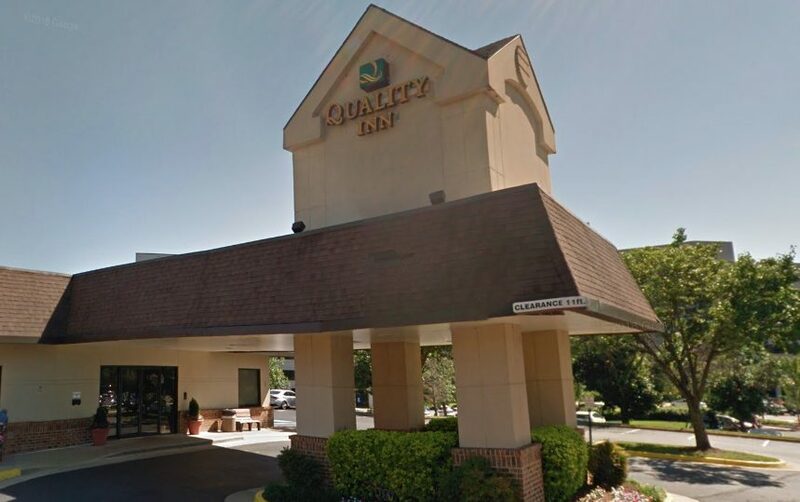 A man displayed a gun and tried to take money that an employee was counting at the Quality Inn on Spring Hill Road in Vienna, according to the Fairfax County Police Department. The man left empty-handed after a brief struggle with the employee, who called out for help, police say. “The suspect is described as black, 6’2″ to 6′ 5″, 180 to 200 pounds, wearing a red and white long sleeve shirt with a collar and a black backpack,” according to FCPD. City of Falls Church police are looking for more information regarding a peeping tom seen outside of Saint James Catholic School (830 Park Avenue). According to a press release, a man was spotted outside of the school on Saturday, April 13, at 7 p.m. Anyone with information is asked to contact the Falls Church Police at 703-248-5053. 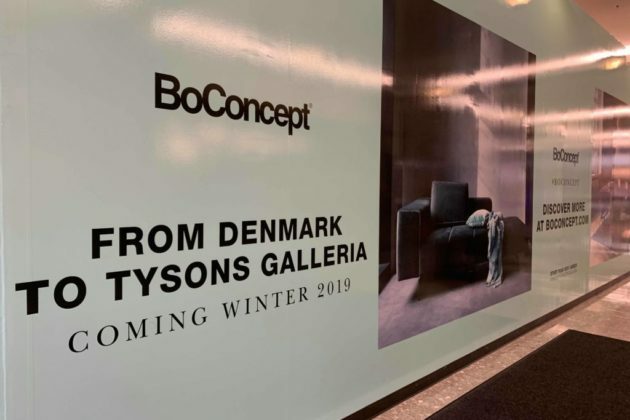 Four years after BoConcept closed its doors at Tysons Galleria, the high-end furniture retail chain is preparing to try again. From 2004 to 2015, BoConcept operated out of the mall’s third floor until the area was converted into a food hall — first the ill-fated Isabella Eatery, now Taste of Urbanspace. But Washington, D.C. franchisee Tim Machenaud said the new location on the main floor will give the store more visibility. Machenaud said there have also been a few changes in the store and in the mall since then that make him more encouraged about the prospects a second time around. 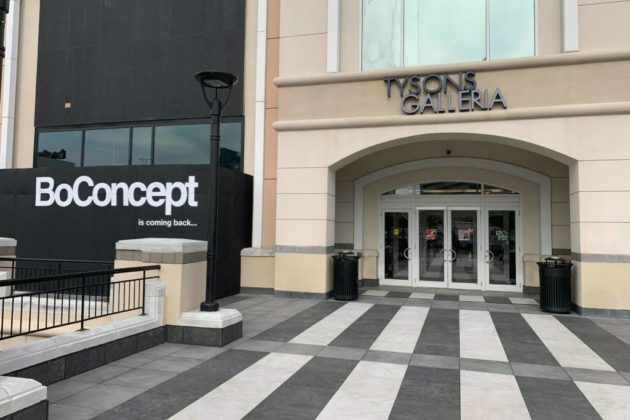 While stores nationwide have faced increased competition from online retail like Amazon, Machenaud said creating a superior retail experience in showrooms, like the one at Tysons, is integral to the furniture shopping experience. Machenaud said feedback from clients has shown that most people buying furniture will visit and average of three to four stores before making their decision. 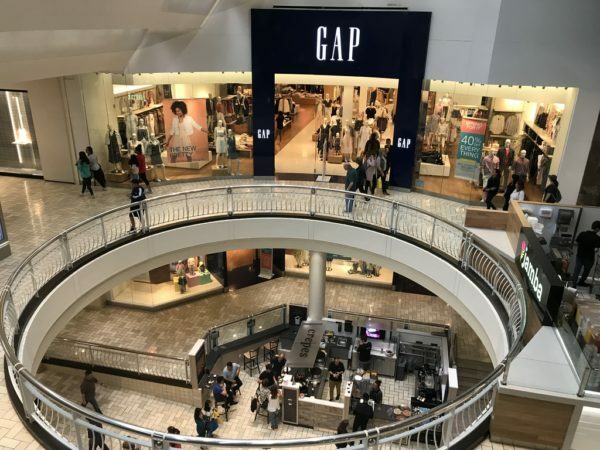 There are currently two other furniture brands in Tysons Galleria — Mitchell Gold + Bob Williams and Calligaris — and Machenaud said having multiple furniture brands in one location will help turn the mall into a quality furniture destination. Meanwhile, the mall is planning to replace the now-closed Macy’s at the north end of the mall with a new suite of retailers like an Apple Store, an iPic movie theater, and a Balducci’s grocery store. A new fitness-themed area is also planned inside the space that was Legal Sea Foods. Be warned, Fairfax County is under a wind advisory and it’s beginning to have residual impacts across the region. Winds are expected to last all day with the strongest winds around noon. ⚠️ A Wind Advisory has been issued for today. 🕗 8 am- 8 pm; the strongest winds are likely from late morning and through the afternoon hours. 💨 Expect 20-30 mph winds with gusts up to 50 mph. 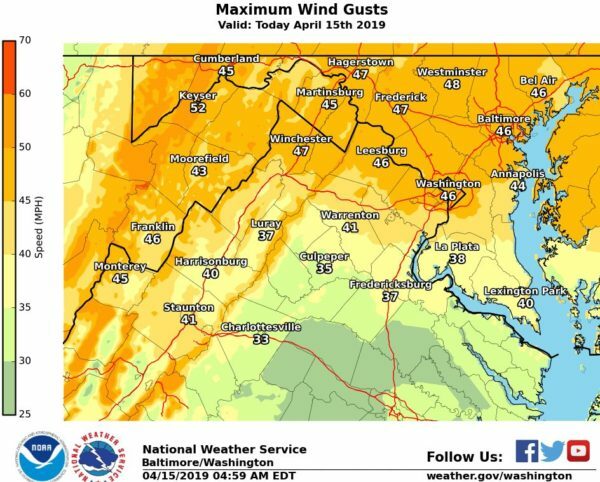 According to the National Weather Service, the maximum wind gusts up to 50 mph are expected throughout the region, with most locations seeing up to 30 or 40 mph wind. The strong winds are also having an impact on some local roads. Early this morning, Westmoreland Street at Orland Street in McLean was closed due to low hanging wires. The situation has been resolved since then and the street is now open.